The UN Sustainable Development Goals (SDGs) have an unexpected champion—forward-thinking business leaders. The Business and Sustainable Development Commission, a group of corporate, finance and civil society leaders, recently released a report showing that achieving the SDGs in just four sectors—food and agriculture, cities, energy and materials, and health and well-being—would create $12 trillion of new market opportunities by 2030. What’s more, the Better Business, Better World report finds, if we consider the savings from reduced carbon emissions, water use and other resource consumption, the overall profit could be as high as $17 trillion. 380 million: Predicted number of jobs created by 2030 by achieving the SDGs in these four sectors. Nearly 90 percent: Percentage of new jobs expected in developing countries. 85 million: Estimated number of jobs created in Africa. 220 million: Estimated number of jobs created in China, India, and the rest of developing and emerging Asia. The business case for the SDGs fits into a larger story. As the New Climate Economy has found, global economic growth and climate action can and must go hand-in-hand, in a way that delivers the SDGs. Now, the Business and Sustainable Development Commission adds an additional pillar that aligns with these: successful corporate strategies. Here’s a closer look at some of the opportunities companies can pursue in the four sectors—and their benefits for human development and environmental sustainability. Roughly 800 million people are undernourished globally, and an estimated 220 million hectares of additional land will be needed to feed the world’s growing population by 2030. The challenge posed to food systems is immense, especially in the context of land degradation due to climate change. $2.3 trillion: Estimated value of revenue and savings from achieving the SDGs in food and agriculture. The top three opportunities are food waste reduction, reforestation and development of low-income food markets. 71 million: Predicted number of jobs created in new food markets, including 21 million across Africa and 22 million in India, where ample cropland and current low productivity pave the way for growth. $155-$405 billion: Estimated value of annual business opportunities by reducing food waste through better storage and other food-saving technologies. Already, half the global population resides in cities. That figure is set to increase to 70 percent by 2050. Cities that are healthy, prosperous and inclusive will need to overcome two big challenges: intensive energy use and urban poverty. $3.7 trillion: Potential profit by achieving the SDGs in cities. The majority of these opportunities are in the building and transport sectors. $800 billion: Profits generated by retrofitting buildings with updated lighting, heating, cooling and appliances. Energy and material consumption raises a striking paradox: current environmental impacts due to energy production and waste are enormous, but 1.2 billion people still lack access to electricity, and supply must increase to fill this gap. 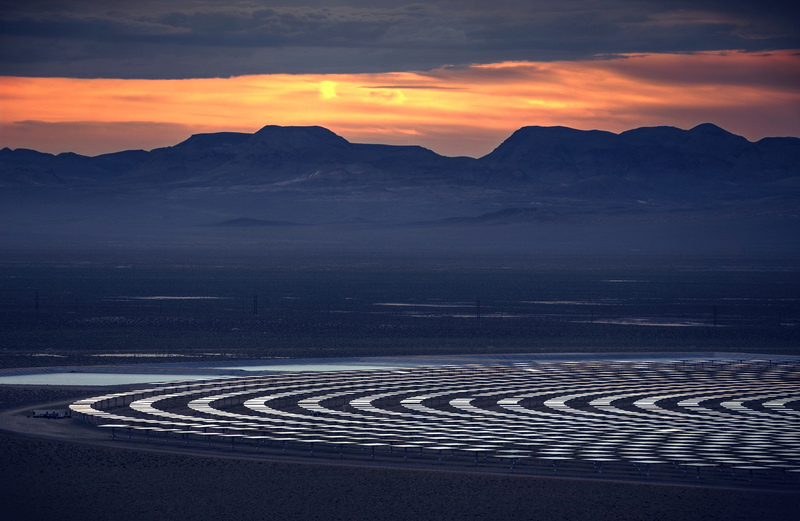 More than 1.5 billion: Anticipated additional high-energy consumers by 2030. $4.3 trillion and 86 million jobs: Potential payoff of circular models, renewable energy, energy efficiency and energy access. $780-$1135 billion: Potential for collecting and repurposing cars and appliances. Currently, cars are generally recycled into scrap metal, whereas appliances are rarely collected at all. The final market opportunity is healthcare. Lack of access is a critical issue in developing countries and skyrocketing costs is a setback in developed ones. 5 percent: Percentage of the developing world pushed into poverty each year by health costs. $1.8 trillion: Predicted value of revenue and savings available from improved insurance models, healthcare that takes advantage of technological innovation, and other improvements to the global health system. 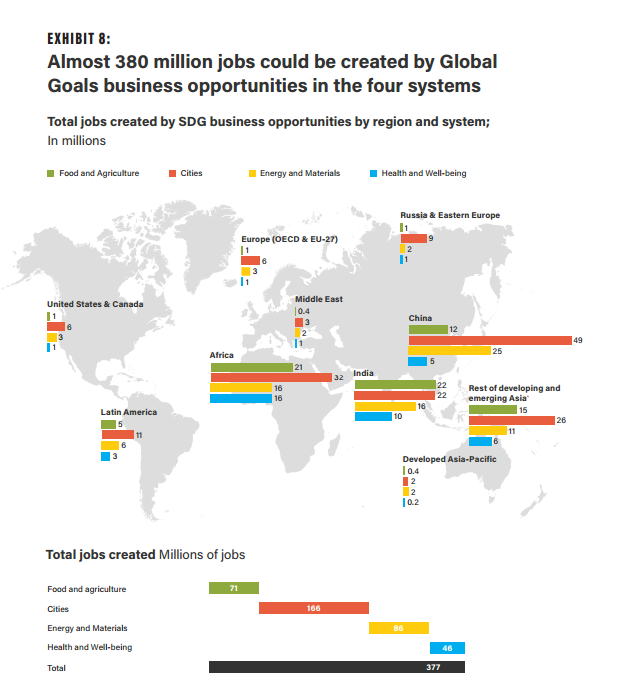 46 million jobs: Estimated jobs created through new business opportunities in health and well-being. Grain silos, microwave recycling, affordable housing and remote healthcare might not seem to have much in common. But innovations like these exemplify the countless ways in which companies can reduce poverty and benefit the planet as they simultaneously generate jobs and profits. After looking at the numbers, it’s hard to argue that sustainable development and business can’t complement one another.